Are you running a series of Facebook ads each with a daily spend which you regularly tweak the budgets for, but you’re not sure if you’re overspending or underspending your total campaign budget? Introducing the Daily Budget Rejigger Excel spreadsheet, designed to help you stay on track with your spending. This Excel spreadsheet is designed to do the maths for you when you need to calculate moving ad spend on the fly. Let’s say you’ve got a campaign budget of $1000 which will last a whole month, but you’ve got 15 ad sets running each with different daily spends. Each day you might increase or reduce the budget on specific ads based on their performance, but you need to make sure that you’re spending your budget wisely so that you a) don’t overspend and end the campaign early, or b) underspend and run out of time. This spreadsheet looks at the campaign duration and overall budget, calculates how many days you have left in the campaign, and lets you know how much you should be spending per day overall. If you add in your ad set details and how much you are spending on each ad set, it will calculate how much you’re spending each day, and whether you are overspending or underspending in order to distribute the money evenly across the campaign. 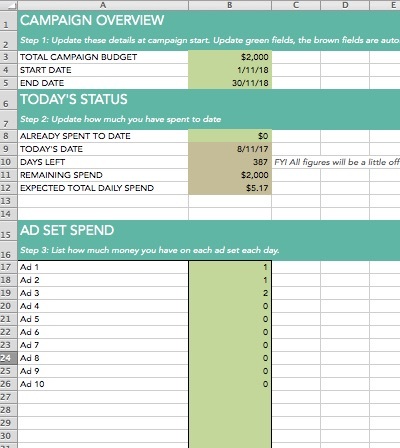 This spreadsheet is designed to be used during a campaign to help update your figures on the fly, as it takes the current date into account when calculating the spend. This is not designed for use before a campaign begins. For a full-scale preview of this tool, please click here and here for screenshots.